Travel Lane County markets Lane County as "Eugene, Cascades & Coast." We are a private, nonprofit association funded by member support and transient room tax generated at lodging facilities and campgrounds. Our mission is to increase overnight stays within the county. 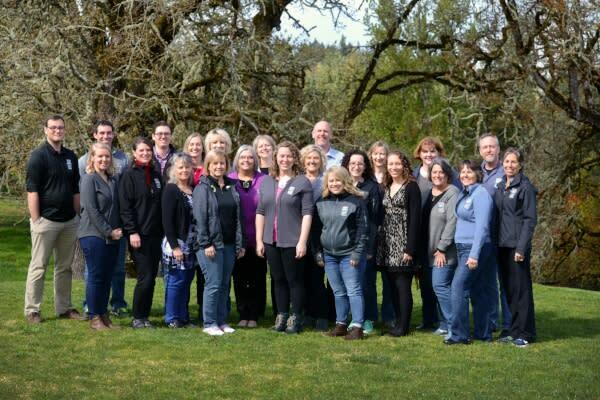 As partners with business, civic, government and community groups, including our 600+ members, we provide visitors with extensive services and resources to ensure a quality visitor experience within Lane County. 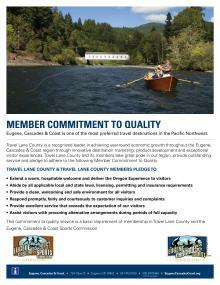 Travel Lane County staff, its members and partners are committed to providing locals and visitors the Oregon experience. 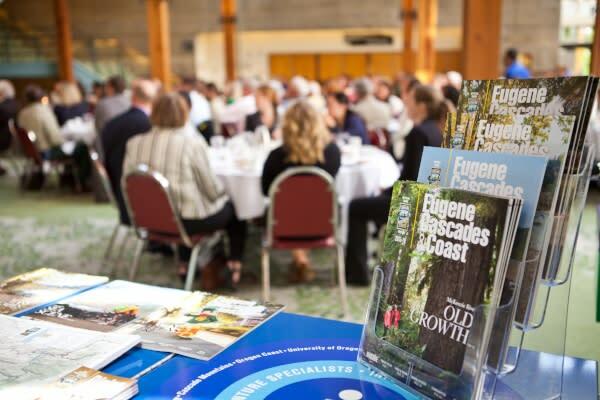 We recognize our industry thrives when visitors return and when they share their positive experiences with family and friends who become inspired to visit the Eugene, Cascades & Coast region. We encourage all member organizations to print the Member Commitment to Quality and proudly display it for employees and visitors. Our members benefit from unique and collective advertising and marketing opportunities with targeted exposure to area visitors. Travel Lane County is comprised of a dedicated management team, with longevity in the industry; an advisory board of regional business leaders volunteering their time and insight; a friendly and professional front-line staff at our visitor centers and mobile outreach; and an enthusiastic group of volunteers and interns assisting throughout the organization. Publishers of the region&apos;s number one Official Visitor Guide and popular Visitor Map. Additional products include the Dining Guide and the Adventure Guide. Hosts a comprehensive regional website, www.EugeneCascadesCoast.org, and competitively utilizes multi-media and social networking. Manages two visitor information centers (located in Eugene and Springfield). The state-of-the-art Eugene, Cascades & Coast Visitor Information & Adventure Center showcases regional visitor services, attractions and events. Targets convention and meeting planners (national and international markets) for event business. Supports and coordinates the Eugene, Cascades & Coast Sports Commission to attract and promote sporting events in the region. Provides unique advertising and networking opportunities to members at affordable costs. Invests in market research, compiles industry information and shares trends and opportunities with members. Participates in many local business and community boards and associations, from sports to RVs to the arts.